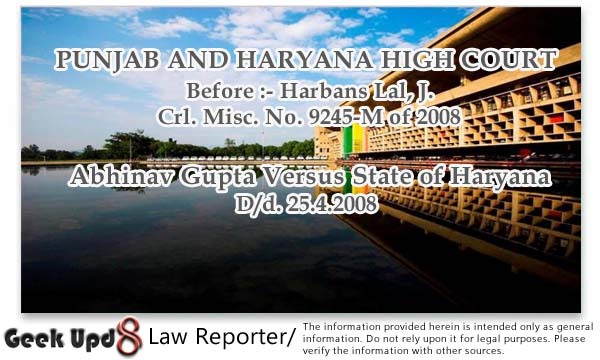 PUNJAB AND HARYANA HIGH COURT Before :- Harbans Lal, J. For the Petitioner :- R.S. Cheema, Senior Advocate with Rohit Khanna, Advocate. For the Respondents :- Madan Gupta, Senior Deputy Advocate General, Haryana. For the Complainant :- Kanwaljit Singh, Senior Advocate with Ashwani Talwar and Pawan Duggal, Advocate. (4) Destroying or altering any information residing in a computer resource or diminishes its value or utility or affects it injuriously by any means. 1. State Rep. By C.B.I. v. Anil Sharma, 1997(4) RCR(Crl.) 268. 2. Mahender Singh v. State of Haryana, 2006(3) RCR(Crl.) 73. 3. Vikas v. State of Haryana, 2007(3) RCR(Crl.) 481. 4. Dua v. State of NCT of Delhi, 2007(4) RCR(Crl.) 405. 5. Gajanand Agarwal v. State of Orissa, 2007(2) RCR(Crl.) 672 : 2007(3) RAJ 61 (SC). 6. Starki Feedinand v. State (Customs), 2005(3) RCR(Crl.) 216 (Delhi). Harbans Lal, J. - This petition has been moved under Section 434 of the Code of Criminal Procedure by Abhinav Gupta-petitioner seeking his anticipatory bail in case FIR No. 86, dated 20.3.2008, under Section 66 of the Information Technology Act and Sections 420/406 of the Indian Penal Code registered with Police Station Sector-55, Faridabad. 2. The minimal facts of the case are these : The petitioner after completing B.E. (Mechanical) in the year 1996 worked with Escorts-ECEL as Manager Designs during the period from 2002-2003. He worked with Terex Vectra Equipment Private Limited as Manager, Designing for back Hoe Loader from the year 2003-2006 (August). Then he worked with JCB India Pvt. Ltd (for short 'JCBI') as Manager Product Engineering (Design) from August, 2006 to January, 2008. 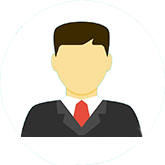 He joined Escorts-ECEL as Divisional Manager (Designs) in January, 2008. The JCBI accepted his resignation vide letter dated 4.1.2008. He was relieved on the aforesaid date after he was given a finalclearance by all the Departments of JCBI including I.T. Dapartment. As per allegations in the FIR No. 86 ibid against him by JCBI containing the allegations that he was exposed to various confidential information, trade secrets of the company and has also confidential drawings, designs plans etc. of the complainant company. During the course of his exit interviewed with the Product Engineering Head, he categorically maintained that he would not be joining any company, which was in direct competition with JCBI and thus assured the Product Engineering Head that all intellectual property information and secrecy so at tained by him during this tenure with JCBI would be confidential at all times. In the 2nd week of March, 2008, the complainant came to know that after leaving the employment, the petitioner has joined Escorts Construction Equipments Ltd., which is a direct competitor of the complainant company. On 11.3.2008, the Management of the complainant-company was notified by the office security staff that some documents pertaining printouts of the E-mail message pertaining to private E-mail account of Abhinav Gupta (referring to the accused) being abhinavdeepti@indiatimes.com were found in the premises of the complainant company, which revealed that these were the intellectual property of the complainant Confidential information containing the confidential files data and designs of the complainant company from his official E-mail I.D. abhinavdeepti@indiatimes.com. From the aforesaid printouts, it has becomes clear that the accused while in the employment of the complainant company was using the complainant, computers, computer systems and computer networks and has got the confidential trade secrets being the designs and drawings of engineering department and had apparently downloaded/transferred the same on the local PC by using which he uploaded the said confidential designs and date on personal E-mail ID being abhinavdeepti@indiatimes.com. A perusal of the accused Abhinav Gupta's mail archive within the cinfidential company suggest that he used to send mails of various subject matters to E-mail ID being abhinavdeepti@indiatimes.com and the abovementioned printouts also corroborate that he was using personal E-mail ID abinavdeepti@indiatimes.com while in the employment of the complainant company and had actually sent/transmitted various confidential drawings including drawings for a Backhoe Bucket Link 40 tanks Fender Post leg Hydraulic rear post Boom-dipper WA drg. Etc.to recipients. By indulging in the aforesaid illegal and wrongful acts, he has committed the offence of hacking under Section 66 of the Act etc. 3. I have heard the learned counsel for the parties, besides perusing the record with due care and caution. 4. Mr. RS Cheema, Senior Advocate appearing on behalf of the petitioner eloquently urged that since the petitioner was not given any laptop computer to carry out this work at home, it was a common practice that on Friday afternoon, the pending work used to be downloaded to the personal E-mail of the designer so that while at home he could access the same from his home PC. This work culture was not only with the approval of the management but also was encouraged by them so that the weekends could be properly and effectively utilized by the designing team. He further added to it that the career graph of the petitioner would show that he worked on the designing and improvisation of Pick & Carry Crane and while in Terex Vectra Greater Noida, he worked on the designing of Back Hoe Loaders. He worked with the complainant company for about four months only in the designing department where work relating to Back Hoe Loaders was being carried out and he was shifted to a new project of the complainant in December, 2006. He further pressed into service that there is nothing unique or innovative in Back Hoe Loaders of JCBI as the said equipment is being manufactured by several other manufactures such as Terex Vectra, L&T and CAT. In these premises, there could be no question of the petitioner hacking into the computer system of the complainant company and furthermore, he was granted clearance by the I.T. Department of the complainant before he was relieved and thus, he has not committed the alleged offences. 5. To hammer home the fact that the petitioner is entitled to have anticipatory bail, Mr. Cheema has relied upon the observations made in re: Mahender Singh v. State of Haryana. 2006(3) Recent Criminal Reports (Crl.) 73, Vikas v. State of Haryana, 2007(3) Recent Criminal Reports (Crl. ), 481, Sanjay Dua v. The State of NCT of Delhi, 2007(4) Recent Criminal Reports (Crl.) 405, Gajanand Agarwal v. State of Orissa and Anr. 2007(2) RCR(Crl.) 672 : 2007(3) RAJ 61 (SC), and Starki Feedinand v. State (Customs), 2005(3) RCR(Crl.) 216 (Delhi). 6. Mr. Madan Gupta, Senior Deputy Advocate General, Haryana on behalf of State, Mr. Kanwaljit Singh, Senior Advocate with Mr. Ashwani Talwar, Advocate and Mr. Pawan Duggal , Advocate on behalf of the complainant countered the above arguments by urging with a good deal of force that a glance through the screen shots (Annexure P-5) would reveal that during the course of his employment with the complainant company, the petitioner used to down load the confidential trade secrets of the complainant on his local PC and upload the same on his personal E-mail ID being abhinavdeepti@indiatimes.com and thus, prima facie the offence is made out against him. 7. I have well considered the rival contentions. The allegation against the petitioner is that he indulged into hacking. Hacking means unauthorized access to computers. When a person destroys or deletes or alters any information residing in a computer resource or diminishes its value or utility or affects it injuriously by any means with intent to cause or knowing that he is likely to cause wrongful loss or damage to the public or any person, he is said to have committed an offence of hacking under Section 66 of the Act. The person, who commits an offence of hacking is called hacker. Hacker is a person who intends to gain unauthorized access to a computer system. Hacker shall be punished with imprisonment upto three years, or with years, or with the which may extend upto two lakh rupees, or with both. Jargon Dictionarytraces the origin of the term 'hacker' to some one who makes furniture with an axe and the term has been used for the first time in 1960s as a badge by hacker culture surrounding the Tech Model Railroad Club (TMRC) at Massachusetts Institute of Technology when its members began to work with computers. The word 'hacker' represents now any person (a) who enjoys exploring the details of programmable systems and how to stretch their capabilities, as opposed to most users, who prefer to learn only the minimum necessary (b) who programmable enthusiastically (c) who enjoys programming rather than just theorizing about programming (d) capable of appreciating hach value, which is defined as the reason or motivation for expending effort toward a seemingly useless goal, the point being that the accomplished goal is a hack (e) who is good at programming quickly (f) who is an expert at a particular programme or one who frequently does work using it or on it. 8. Webster's Dictionary defines the term 'hacker' as a computer enthusiast who enjoys learning everything about a computer system or network and through clever programming, pushing the system to it highest possible level of performance. 9. A hacker is a computer expert whose intrinsic curiosity persuades him to break in computers. Hacking is computer trespass. To make hacking an offence dependents on mens rea. Base on the intention, hackers are divided into two groups: (1) Hackers who have no intent to do any criminal activity. These hackers do not consider breaking into a computer system a crime. They consider themselves members of an elite meritocracy based on ability and trade hacker techniques. They are skilled computer users who penetrate computer, with a sole purpose to gain knowledge about computer system and their actual working. (2) Crackers who intend to engage in criminal activity. This dichotomy of hacker and cracker has come on the scene in 1985 to distinguish between "benign" hackers from hackers who have malicious intention. Crackers maliciously sabotage computers, steal information located on secure computers, and cause disruption to the networks for personal or political motives. Computer break-ins have been on the rise. 10. Hacking by insiders is quite common. As per Mathew Nelson, Internet Security Systems Chris Klaus, the employees commit eighty per cent of the attacks on computer systems and another survey reports seventy one per cent unauthorised accesses by insiders. The disgruntled employees are considered the greatest threat to computer's security because they have knowledge about the target computer that allows them unrestricted access to cause damage to the system or to steal system data. According to Congressional Statement, Federal Bureau of Investigation, National Infrastructure Protection Centre (NIPC) Cyber threat Assessment, October, 1999, however, there are various security measures that can prevent hacking by passwords, Firewalls, Encryption, Digital Signatures, Clipper Chip etc. but despite that the security of the computers connected to Internet can be breached at many points. One of the attach prone areas is the operating system of service provider's hardware. 11. For a cyber crime to fall under Section 66 of the Act, one must observe whether criminal intent was present or not. An act is intentional if it exists in idea before it exists in fact. Hacking signifies mischief with the computer resource. It is a mischief regarding destruction or alteration of any information residing in a computer resource. Section 66 of the Act defines hacking activity in a comprehensive manner. It takes hacking activity exclusively associated with the computer resource. (c) Causing wrongful loss or damage to the public or any person. (d) Destroying or altering any information residing in a computer resource or diminishes its value or utility or affects it injuriously by any means. It involves an invasion of right and diminution of the value or utility of ones information residing in a computer resource. The hacker must have contemplated this when he hacked a computer resource. Hacking involves mental act with destructive animus. 12. The data residing in a computer can be downloaded by converting the same by copying in CD or Floppy. The data of PC (computer) can also be received by online blue tooth, E-mail or cracking etc. "We find force in the submission of the CBI that custodial interrogation is qualitatively more elicitation-oriented than questioning a suspect who is well ensconced with a favourable order under Section 438 of the Code. In a case like this effective interrogation of a suspected person is of tremendous advantage in disinterring many useful informations and also materials which would have been concealed. Success in such interrogation would elude if the suspected person knows that he is well protected and insulated by a pre-arrest bail order during the time he is interrogated. Very often interrogation in such a condition would reduce to a mere ritual. The argument that the custodial interrogation is fraught with the danger of the person being subjected to third-degree methods need not be countenanced, for, such an argument can be advanced by all accused in all criminal cases. The Court has to presume that responsible police officers would conduct themselves in a responsible manner and that those entrusted with the task of disinterring offences would not conduct themselves as offenders." 10. The petitioner has subsequently filed an affidavit to the effect that during the course of arguments on 11.4.2008, it was submitted by the counsel for the complainant that a search was carried out at his residence on 10.4.2008 and allegedly the police had found a computer at his residence without CPU/Hard Disc, which is totally false. Learned State counsel states that as per search memo, nothing associated or in relation to the crime could be detected in the rented flat of the petitioner. The non-recovery of any such material at this stage does not dilute the commission of offence. 11. To elicit, how and in what manner and for what purpose the confidential trade secrets were stolen by the petitioner by downloading, custodial interrogation being qualitatively more elicitation-oriented is required. The skill employed in such process being technical in nature can be known or disinterred by mode of custodial interrogation of the petitioner. The Investigating Officer cannot be expected to be conversant with such technicalities or hyper-technicalities. So, if the petitioner is admitted to anticipatory bail, he under the umbrella thereof will feel well protected and ensconced and would not divulge the technicalities used in hacking or cracking the confidential data from the complainant's computer system. The grant of anticipatory bail to the petitioner would hamper the investigation. Such bail can be allowed in extra-ordinary circumstances, which do not exist herein. In view of the preceding discussion, this petition is dismissed. Trespass is a tortuous crime, it act and cyber laws are slowly catching up harsher punishment is the order of the day .